Advantages: Great as a modeller's colours and markings reference; logical structure by variant; 128 colour illustrations including 32 subjects covered in four-view diagrams; all profiles usefully captioned; captions clarify some misunderstandings about the use of "Sky" and other lower surface colours; tie-in with future decals. 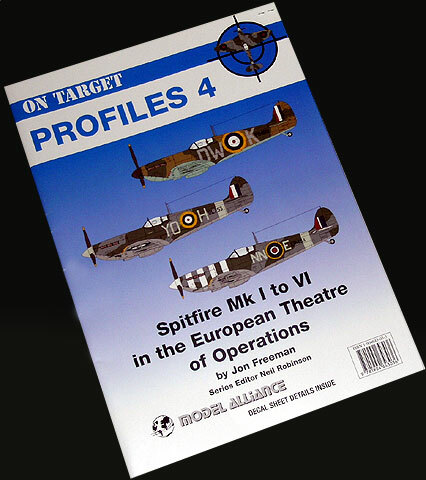 On Target Profiles 4, "Spitfire Mk.I to VI in the European Theatre of Operations", continues this useful series of books for modellers. The new book is presented in A4 format and comprises 32 pages between its soft cardboard covers. The focus of the book is the iullustrations - not surprising as Jon Freeman, the author, is a well-known British illustrator whose work has been regularly seen in Scale Aircraft Modelling magazine. No less than 128 aircraft illustrations plus a stack of scrap view drawings of nose art and other special markings are packed into the new book. These cover 80 different aircraft - 64 are depicted in side profiles and 16 feature four view diagrams with both sides, upper and lower surfaces all shown. All the artwork is in full colour. 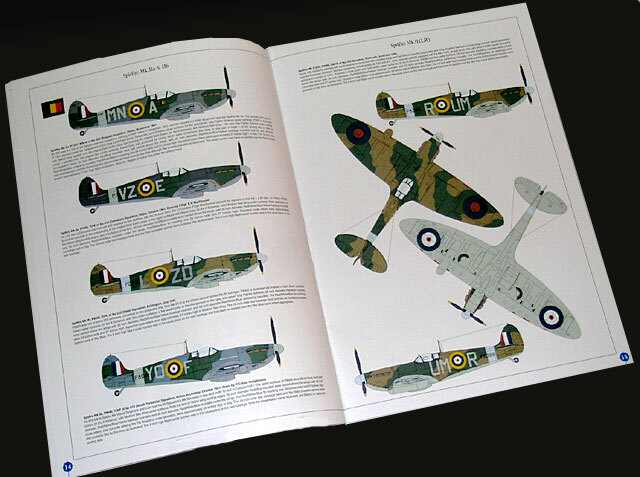 The illustrations are organised logically by variant - Spitfire Mk.I (including a few rare Mk.Ibs), Mk.IIa and b, Mk.Vb. Mk.Vc and Mk.VI. These are all nicely rendered. Yet this is more than just a picture book. Yes, the illustrations do represent great inspiration for modellers, but Jon Freeman has been careful to point out some interesting deviations from common beliefs about RAF camouflage colours - lower surface colours in particular. The captions discuss the transitions between colour schemes and markings, and also point out the introduction of Sky plus a variety of substitute colours and local mixes that were applied around the same time. The discussion and illustration of "Duck Egg Blue" (ie,not Sky); and BS381 No.1 Sky Blue (also not the same as Sky); and various mixes of light blue and light grey suggests some interesting potential for painting models of Battle of Britain Spitfire Mk.I subjects. The depiction of Sky Blue fuselage bands and spinners on Dark Earth / Dark Green Spitfires is also fascinating. I really enjoyed this latest title in Model Alliance's Profiles series. "Spitfire Mk.I to VI in the European Theatre of Operations" will be a terrific source of inspiration and a fascinating reference source. Its conclusions will undoubtedly provide some interesting points of discussion for WWII RAF modelers!